Let’s be real, sometimes it is hard enough just living with your family, but moving out to live with new people - that’s a whole different story. Moving out of home for the first time can be a daunting experience, particularly when it involves living with people you’ve never met before. You will have your mum in one ear, telling you about all the house rules you need to set with your new housemates and guaranteed she will also try to label all your pots, cutlery and Tupperware ‘just in case’. But living with new people isn’t about being paranoid of your pots and pans being used without permission, it’s about getting used to living with people who come from different backgrounds, places and who have different personalities to you. 1. Be patient and tolerant. The first tip for living with new people would be to learn patience and tolerance. It’s important to remember that you’ll be living with people who have had different upbringings and may have different ways of doing things. At first, you and your roommates will all probably be too scared of each other to leave so much as a dirty spoon in the sink. But as time goes on and you become more comfortable with each other, things are going to slide. Dishes are going to be left out overnight, maybe longer and this can be extremely frustrating. Being tolerant and patient is a good way to deal with this. Give them 24 hours to remedy the situation. Then, if it’s not done, calmly ask them to clean up after themselves as you too would like to use the kitchen. Being patient and not aggressive is key. However, in order to not have to deal with this kind of situation at all, set house rules like mum said four months ago and make sure you lead by example and follow them. 2. There’s nothing wrong with a cleaning roster. Another tip would be to have a system in terms of cleaning up communal spaces, such as the bathrooms, kitchen and lounge. Let’s be real, no one is going to want to vacuum every day, so make a roster of who is doing what each week. That way it’s fair, and sets the expectations of yourself and your flatmates. Having the roster in writing also keeps everyone accountable and should mean there will be fewer arguments. 3. Buying household essentials—sort it early. Tip number three would be to work out whose turn it is to buy the toilet paper, tissues and cooking oil— all of which are usually communal items— through a roster or reminder system. This ensures that no one is stuck with buying the lot, or a Mexican standoff that involves using paper towels instead of toilet paper when there’s none left. Trust me, you don’t want the latter. If your flatmates are a little forgetful, or you’re super organised, another alternative is to start a house kitty for essentials that each flatmate pays into either weekly or monthly. This will ensure that you don’t end up buying everything and have to wait to be reimbursed. My best tip though would be to nurture friendships with your roommates by going out together and making plans with them. 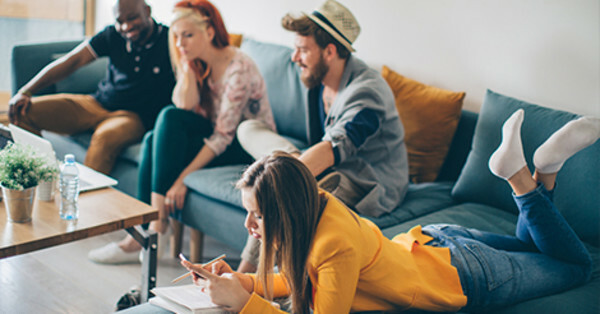 Have a roommates-only movie night or a ‘family dinner.’ These bonding sessions will help you get to know the people you will be living with and might mean that when it comes time to moving out, you will have made friends for life or even be roommates again in the future. Bianca is a journalism student at the University of Technology Queensland. Having just completed her first year at university and moving out of the family home for the first time, she's amassed a wealth of experience that she hopes will help future university students.